How did you get started sewing? I have always been making things, and after sudying Textile and Fashion design in Paris, I moved to London to work as a freelance designer and pattern cutter. bagatelles&co started last summer when I was desperately looking for a nice evening bag for a wedding I was attending. I couldn’t find anything beautiful yet affordable so I ended up making my own…! I haven’t stopped making bags since then! Any advice for new businesses starting out? I'm still quite new but I'd say don't be afraid to try new things and to get out from your comfort zone. Be perseverant and believe in yourself. Things do not happen overnight, so be prepared to work very hard. Believe in your dreams! with your favorite item from rym's shop. twitter, facebook, or blog about this giveaway. please check back next week to see if you are the lucky winner! congrats to #208 - bibliochic, the winner of the proteales giveaway! thanks to proteales for the generous $40 gift certificate! this is a fabulous giveaway! I adore the Japanese Flowers, Bold Peacock, Sweet Pillowy and Indigo Flowers! What a great giveaway! I am absolutely drooling over the Multi-floral Lili clutch---Liberty cotton Medium clutch! OOOH. My favorite is most definitely the Spring Garden Gigi purse. I love the Gigi purse! Especially in bright yellow silk. I also love that this prize's value is the answer to the universe. Is that little geeky fact intentional? It was hard to choose, but my favorite is the Soft Peacock Gigi Purse. I love the pop of the contrasting lining! i like the bold peacock bag! I love the large Ambrosia and the medium Golden Arabesque clutches! i love the multi-colored floral liberty print - gorgeous! thanks for the chance to win and a new favorite store! these are SO adorable it almost hurts. everything in the shop is seriously classy and beautiful. I especially love the autumn forest gigi purse. I am in love with the Purple Flower Clutch!!! Perfect for carrying around on a spirng day! There are so many great things! I like the butterfly lili clutch a lot. definitely the Bold Peacock Gigi Small Purse.. love it! summery blue floral gigi purse puh-lease! I am loving that Anglomania clutch! Those little skull and crossbones! LOVE! Gorgeous giveaway! My favourite as to be the Sweet pillowy Gigi purse - divine. How to even choose a favorite?! Everything on her site is too precious! I love the strawberry purse! Or the multicolor floral clutch. Eeek, what I could do with the win on this post!! i love the summer sunshine gigi purse. it's beautiful! lovely purses! my favourite would be the red floral gigi one! it was so hard to pick a favorite! i love the Festive Gigi purse in Khaki because of the eclectic color combination! Wow what beautiful product she designs! My favorite would have to be the Golden Arabesque clutch with those adorable vintage brass balls on top! love the azulejos gigi purse..very lovely! 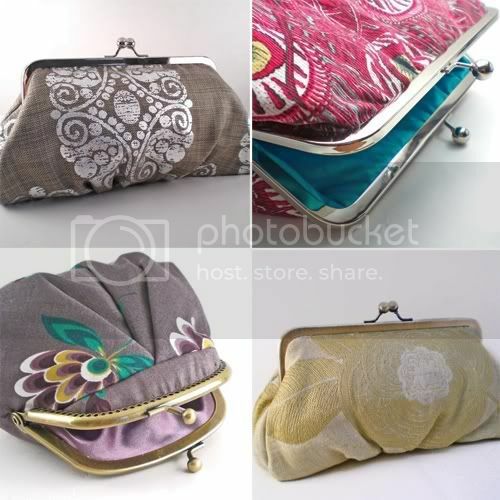 `Well I like all of them,lol.But my favs are Purple flower Gigi purse.Dreamy Lili clutch! I love the poudre gigi bag! So sweet. My favorite is the Soft Peacock Gigi Purse, but most of the Gigi styles were my favorite. SO many lovely things! I really enjoy the small red floral Gigi purse. Thanks for introducing us to all of these wonderful entrepreneurs. Happy Monday! I love the Indigo flowers---Liberty cotton Medium Lili clutch! The Spring Garden Gigi purse is definitely my favorite!! What a cool line of purse designs! definitely the Azulejos Lili clutch! so beautiful! I love the Sweet Pillowy Gigi Small Purse. Simple, but lovely. I did a blog about this as well! I love the red floral and floral bouquet Gigi purses. So cute! I can honestly say I love them all! I particulary heart the Red floral Gigi purse and the Purple Flower Gigi! such a great giveaway! i have two favorites - the butterfly medium lili clutch and the silver garland lili clutch. Been really into peacock styling lately so I am really digging the Bold Peacock small purse. So chic. my absolute favorite is actually one that you have posted on this blog! it's the Silver garland---Luxury Medium Lili clutch. i wear so much black/grey combo in my wardrobe. i guess working in the salon/spa industry for a few years embedded the need in my DNA or something. lol. great post! I'm a fan of the Bold Peacock Gigi small purse! So many beautiful choices, but my favorite is the Azulejos Gigi! ooh the long silver circles bag is pretty! sometimes, i need to take a break from SO much color. I forgot to list my favorite item!! Great etsy shop - I really like the silver garland but I would take any of these precious lil clutches. Red floral gigi purse. LOVE! 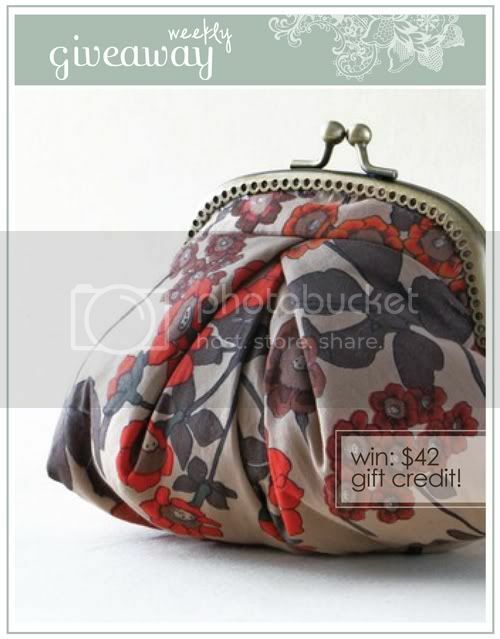 hello, this is a great giveaway to start the week ;-)i like the spring garden gigi purse. I love the Gigi small purse... i could use it as a little bag for my upcoming wedding! I think the green paisley Lili clutch is gorgeous! Oh my goodness - there are just way too many beauties to choose from... but I do absolutely adore the Azulejos! I love the Autumn Forest Small Gigi Purse! I love, love, LOVE, all of the Liberty print Lilli clutches! Would definitely use my GC toward one of them. Wonderful giveaway! The red floral gigi purse would look fabulous with my spring wardrobe! super lovely giveaway!! I adore the Bold Peacock Lili clutch so beautiful! I just found your blog recently - wow!! This is a lovely giveaway. My favorite is the Red Floral Gigi purse. all of them are just absolutely lovely! i think my favorite would be the Bouquet Gigi Purse. i can't resist the adorable blossoms. The Carnelian garden---Luxury jacquard medium Lili clutch is GORGEOUS! Beautiful work! My favorite is silver garland. I love the deep purple gigi! I love everything! The bold peacock gigi is my favorite. you have such fabulous give-a-ways! Thank you for this generosity! I could make matching jewelry to go with all of them! Hello! Lovely purses and very tasteful textiles choice. I especially like the Floral bouquet Liberty silk Lili medium clutch. Oh man, I love them all. The ones with the big ball claps are extra fun! oops.. the "red floral gigi" purse it's called. So many to choose from, such a talented artist and sewer she is! Those clutches are absolutely lovely! Thanks so much for the chance to win. I am loving the peach, orange and pink combo right now ~ so my favorite is ~ Amber floral, Luxury jacquard! i loved her design.. all the purses are amazing!! my favorite one is red maze small gigi purse..
and i posted about this on my sidebar!! LOVE these. Great giveaway. I heart the purple flower clutch, I posted it on my blog a few weeks ago. It's lovely. Love the A day in the countryside---Luxury floral medium Lili clutch. these bags are so so so gorgeous. i love the poudre gigi bag. i would looooove to win this. the multi-floral lily clutch is beautiful. perfect for spring! my vote is for the Silver garland---Luxury Medium Lili clutch. i love the metallic shine of the fabric and that i can use it with any outfit. the Purple Flower---Printed Cotton Medium Lili Clutch is so pretty! Love the day in the countryside- Luxury floral Lili clutch! Anything floral makes me happy. Wow her stuff is great! I'm totally loving the Bold Peacock---Liberty cotton medium Lili clutch. Want it in my hands right now! It would look fabulous with a pair of dark blue skinny jeans and a solid colored tee. Oh goodness, they're all so wonderful! I love the Silver Circles and the Tapestry Flower designs--lovely! Have fun with this gorgeous Giveaway! My favorite is the electric blue gigi! This shade of blue..... sigh...... amazingly adorable!! http://www.etsy.com/view_listing.php?listing_id=41936387 I love this one! Love the bouquet gigi purse...so cute! silver circles clutch - lovely. they are all lovely, i can't pick just one! The Bold Peacock small purse, I think. These are really lovely. I'm absolutely in love with the Japanese Flowers Gigi purse, thanks for sharing this awesome find! wow, these are all so cute! I especially like the Festive gigi in orange. just love the vivid colors! ooh, I found this shop recently and love its cute little clutches! I love the multicolored floral Liberty print Magnolia clutch with chain! so perfect for spring! as is the similar Spring Garden Gigi Purse. I just love the bright colors! I just staring into its colour as if I'm hypnotized. so stunning 0 i love the metallic of the Silver garland---Luxury Medium Lili clutch! Wow, there are so many great options. My favorite is the Victoriana Medium Lili Clutch. It's so hard to choose! I love the Anglomania Gigi purse and the Red floral Gigi Purse! LOVE. These are all so colorful and classic. I love the styles with the bows, especially. I love the Fuschia Aenomium Gigi Purse. Its got just a touch of color but can still go with just about anything. oooh I think the Red floral Gigi purse is my fav! Thanks for the giveaway!! I love them all, but especially the MultiFloral Lili clutch in Liberty cotton~ soooo cute! i loooove the Poudre Gigi Purse! it is so dainty and brings all pink images flowing to my brain! oh I love those bags!!! My favourite is the gorgeous Red floral Gigi purse. These purses are awesome! I especially love the red floral gigi. I fell in lov ewith Summer garden---luxury jacquard and leather clutch bag !!!!Gorgeous!!!! I'm in love with the japanese flower gigi!!! I adore the Summery blue floral Gigi purse! Love these clutches! So pretty!!! Lovely giveaway!! I love all the gigi purses! Thanks for that!! my favorite is the red floral Gigi purse! oh, my! A wonderful giveaway! ok, I LOVE the japanese flowers gigi purse > http://www.etsy.com/view_listing.php?listing_id=42943285 Thanks for that! I love the summer sunshine bag! Mmm... I love the Sweet pillowy Gigi small purse. The gray stripes with yellow contrast fit my style to a T! It's classy with a twist. I love the Bold Peacock Gigi Small Purse! It is so cute! I have been looking for a cute little purse! How exciting! I love these!! The Red Floral Gigi is definitely my favorite!! I'm getting more into gray which this one has. I am afraid that if i dont win and get the japanese flowers gigi purse I may just die. What a fabulous store. Am eagerly waiting for pay day. Her shop is amazing, would love to win! My favorite is the Red floral Gigi purse. I must say that my favourite is the Bouquet Gigi Purse. So lovely! the pattern reminds me William Morris' ones from the Arts&Crafts movement. loooove! ^^ preety things makes me happy and this is the perfect example of this..
Delicate Dandelion Clutch!!! It is absolutey stunning and I wish I had fabric like that I would make; pillows, a duvet cover, drapes, a dress, a skirt, a blouse..... you get the point. That's how gorgeous this fabric is. I love the red floral gigi purse, but they are all spectacular! I'd pick the Poudre Gigi Purse, it's adorable and so feminine. I like the red floral one in your post. awwww bagatalles & co really makes some beautiful items! my fav one has to be the Silver garland---Luxury Medium Lili clutch! thanks for a chance at this giveaway! What beautiful little jewels these are! My favorite is the Bold Peacock Gigi Small Purse. Love them all! I don't want to pick a favorite! Cheers! the purple flower gigi small purse is so perfect for holding something special! thanks for the chance! Gorgeous bags! I like the summer garden shoulder bag. So dainty and cute! I love the peacock fabric and the Gig style is beautiful. Left a comment on bagatelle's blog and talked about it on my facebook too. I am a big fan of the Victoriana Medium Lili Clutch! It goes with almost anything and stores all the essentials :) Perfect! i love the Purple flower Gigi small purse. i love the pleats. totally adorable! i love, love the sweet pillowy gigi purse!!! it reminds me of an elegant ball gown. the purple clutch is sooooo cute!!! I love the bold peacock pattern! i quite love the bold peacock print clutch! it's such a different pattern and incredibly eye-catching. These are so beautiful; love the saree fabric inspired ones especially. i love the Summer sunshine---Luxury silk Gigi purse...it would give a great pop of color... its the last one! I'm loving the Festive Gigi purse in Orange!! So pretty! Summer Sunshine small purse is my favorite!! I'd love that pop of yellow! What beautiful purses! I love the bouquet gigi purse and soft peacock. What a wonderful shop!! I'd have to say the Red floral Gigi purse is definitely my favorite. Azulejos Gigi and Shocking Pink Gigi are my favorites. Love love love Summer Countryside... beautiful! I'm in desperate need of a travel jewelry bag and I think the Tropical Night Gigi purse would be perfect! it's so hard to choose one favorite but if i have to it would be the spring garden gigi purse. thanks a bunch! These clutches are awesome!! I love the Purple Flower Girl Gigi. I love the Shocking Pink Gigi purse. Aww so cute! I love the Festive Gigi purse in Khaki. This is the giveaway to end all giveaways! Everything is so gorgeous, but the Gigi bag trumps them all. Such an unusual shape with so much interest. Well done! Everything's lovely, but I especially love the Ambrosia Clutch. So pretty! Thanks for a great giveaway! Also just Tweeted about the giveaway! I can't get enough of the soft warm yellow used in the Tapestry Flower clutch... elegant, but earthy. love the floral tapestry bag. I absolutely love the Victoriana Medium Lili Clutch--it's understated yet elegant. Wow! I am in love with the tapestry flower and the silver garland fabrics. And, the Gigi bags are adorable. the "day in the countryside" bag is ADORABLE.